Hana yori dango is a very famous expression in Japanese (and the title of a very popular manga and subsequent television series). It means dumplings rather than flowers signifying that people are more interested in the practical, rather than the aesthetic. I fully agree. Dango is a Japanese dumpling or sweet made from mochiko (rice flour), usually served skewered on a bamboo stick, but not always. In fact, in 2 of the 3 places I showcase here that is not the case. They have been around since people can remember and are best eaten together with green tea. All of the 3 places below have an interesting history and serve each a different type of dango. You can find a map with the 3 locations at the bottom of this article. Habutae Dango is nearly 200 years old and was a popular spot to hang out for literary talents in the late 19th century and early 20th century such as Natsume Soseki (1867-1916) and Masaoka Shiki (1867-1902). The old store is very large with plenty of space to sit, and includes a beautiful inner garden with koi fish. A very pleasant space to spend an afternoon and eat yakidango or an-dango. 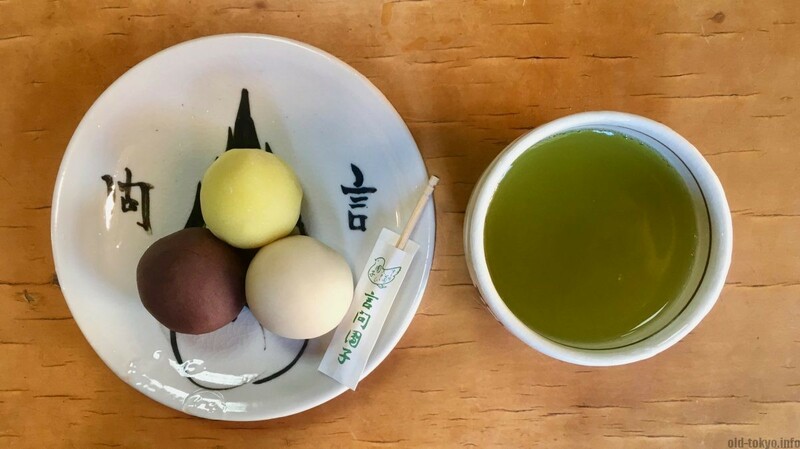 You can have the dango as a set with matcha tea. Read more. 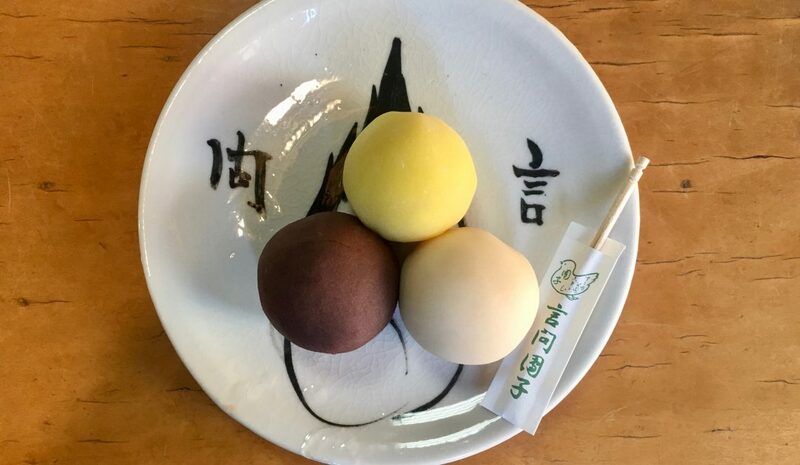 Kototoi Dango in Mukōjima was established in the early 19th century and is famous for the tri-coloured dango that are served on a plate, rather than on a skewer. The name Kototoi originates from a poem in which a seagull is featured, and was the name of a nearby bridge that lent its name to this store. Their dango are very soft and easy to eat and come in 3 colours: white anko (white), red anko (red) and miso (yellow). Read more. Kusa stands for Japanese mugwort and it gives the dango a slight bitter taste. That is why it is often served with anko (red bean paste) to make it sweet. 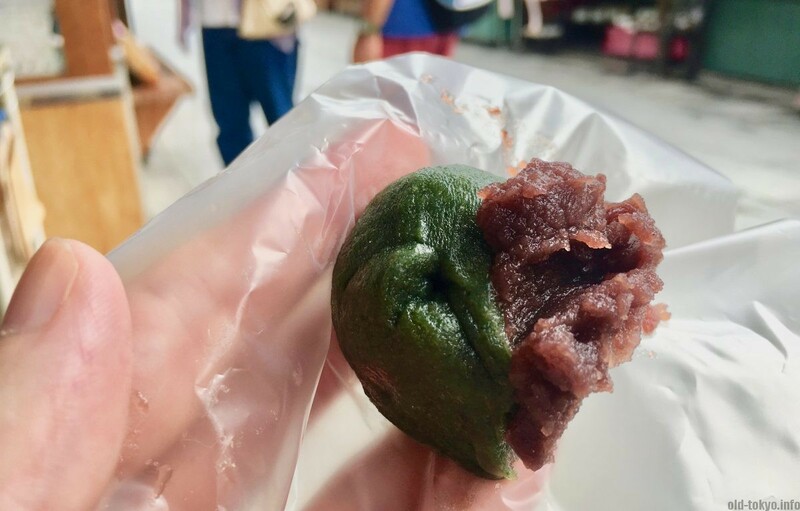 It is a dango that can be enjoyed all over Tokyo, but in Shibamata there are a quite high number of shops close to each other specializing in this variety. Many of the shops serve them on a skewer, but a store called Yoshinoya (pictured) serves them fresh in a plastic foil. Read more.